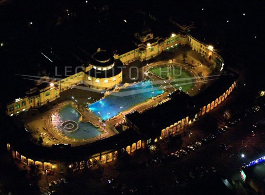 Visiting a thermal bath and bathing in the hot spring water of Szechenyi Baths can be a great way of spending a relaxing and refreshing day for anyone in Budapest. However, there are some certain health / physical conditions in which case the thermal water or any massage therapy is not recommended, or even contraindicated. To make sure that your visit will remain a carefree and pleasant stay, please read the following recommendations and advices. 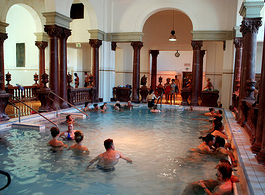 Visitors with infectious skin diseases, or skin conditions that are worsened by thermal waters, or people with heart problems and high blood pressure are not recommended to visit the baths. 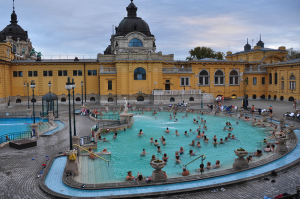 We suggest consulting with a doctor before taking a visit to the spa baths if a visitor has a certain health condition, which may prevent her / him for enjoying the spa waters in Szechenyi Baths. We ourselves cannot give medical advice for obvious reasons, but we are happy to provide any necessary information you may need to make an informed decision. If you are pregnant, have a known allergy or suffer from a medical condition such as high blood pressure, diabetes or have had cancer within the last 5 years, please consult your doctor. Following this advice, please notify us of any condition of which we should be aware, prior to completing your booking or if your medical condition subsequently changes after your booking has been made. We reserve the right to request and view a doctor’s letter prior to entering the Spa or providing a treatment and, if necessary, to refuse the treatment on medical grounds or ask that you sign a disclaimer. Ladies may take part in a massage treatment during their period, however, we ask you kindly to notify the masseur. In this case no strong massage can be applied on the waist area. Children over 14 years old can go to the baths, under 14 the pools are not recommend for kids, but if the parents decide to come anyway at their own responsibility, they can. Children & babies who are not dry and clean yet (being potty trained) are not allowed in the pools, not even with a swimming nappy. During pregnancy please keep consulting with your doctor whenever you intend to visit public baths, shared pools. Pregnant women are kindly asked to consult with their doctor /OBGYN if they can bathe in the thermal waters. 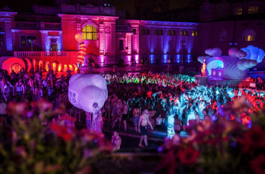 Pregnancy Massages: Unfortunately, no thermal bath in Budapest offers pregnancy massage in the baths to avoid any potential medical complications. Hi, I currently have a wound on my knee and it is still an open wound. Been doing treatment for 5 days now. 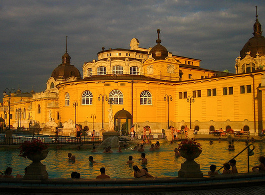 Is it okay to visit the thermal baths? Thanks. 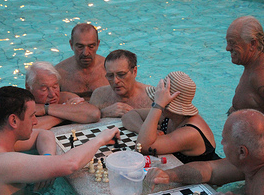 we recommend you consult your doctor and wait until the wound is healed before entering a public pool.